Flash is the hottest technology in the storage industry today. But with all its touted advantages, there are some challenges – including how to effectively measure the performance benefits for your own environment. Effectively measuring the performance of flash arrays requires more than the basic freeware benchmarking tools. It requires the ability to assess advanced functions such compression, deduplication and pattern reduction processing to minimize the amount of data written to flash memory in order to lower the cost per GB and extend flash longevity. It requires the need for specifying complex data patterns in these data reduction technologies. Measuring performance without taking these features into account could falsely overstate the performance of a flash array by a factor of 2 or more. The Evaluator Group working with Load DynamiX and other industry performance experts has documented a testing methodology designed for All Flash Arrays. 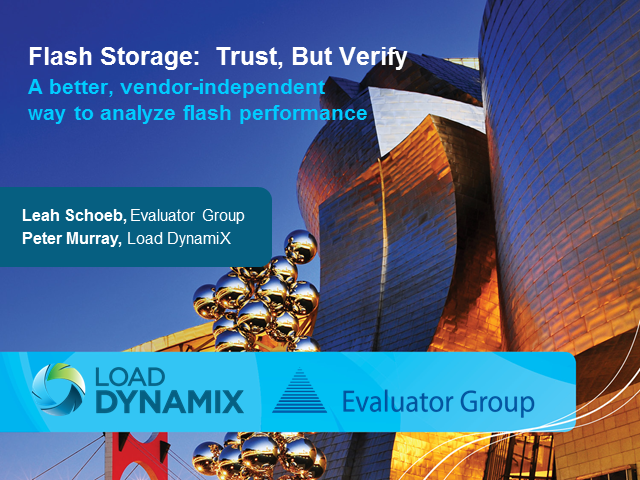 In this webinar Leah Schoeb from the Evaluator Group and Peter Murray from Load DynamiX discuss the critical considerations for measuring true solid state storage array performance. Attend this webinar to learn how to best validate the performance of potential flash storage arrays in order to optimize costs and avoid performance surprises. The foundation of GE Infrastructure Services (GIS) is its storage infrastructure. If it doesn’t provide a high performance, highly available environment for all applications and programs, then innovation suffers. And that can’t happen at GE, a company known for innovation. -Mitigate risk, and “Rightsize” storage purchasing based on performance requirements. Flash storage is on top of every IT professional's mind; however, how much flash do you really need? Are you in need of an all-flash or a hybrid solution? Which workloads and applications see most return when used on flash? In this interview, George Crump, lead analyst with Storage Switzerland, and Len Rosenthal of Load DynamiX engage in a lively discussion to to uncover strategies and the latest technologies available that can help you make the right vendor selections, decide how much flash storage you need, evaluate and assure performance and optimize the cost. Public cloud providers like Amazon and Rackspace have demonstrated the advantages of an elastic, self-service model for provisioning workloads. However the very public nature of the public cloud makes it unacceptable to many organizations. Those seeking to deliver the infrastructure as a service model to their business units are building private clouds using tools from VMware and The OpenStack.Project. While IaaS promises lower cost and more agile infrastructure, it hides the nature of many applications from the IT department making it difficult to match storage deployment decisions to workloads. In fact, many IaaS projects stall when storage performance fails to meet user’s expectations. This webinar will reveal the challenges facing an IaaS storage infrastructure from the tragedy of success to noisy neighbors. We’ll then explore how innovative IT organizations address these challenges when designing a storage infrastructure. Just as importantly we’ll discuss how storage workload modeling and performance testing can help you ensure performance and lower storage costs.